I recently read the book “Best, Worst, First” by Margie Aliprandi. This is a very unique book of short interviews with successful network marketers sharing their best, worst and first tips. What I want to do in the paragraphs below is share some of my favorite quotes from the book. Each quote is in bold an italics. After each quote I will share my own two cents. Enjoy. # 1 One of the biggest things we do as leaders in our business is seeing that untapped potential in people, even before they are fully keyed into it themselves. Our job as leaders is to look for the best in people. # 2 Know also there will be attrition. People you have invested your heart and soul in will leave. Most people will quit, regardless of what you do to help them. Be prepared for it. # 3 What you focus on expands. You become what you think about. # 4 Stay passionate about your goals. Have a big WHY and keep your goals in front of you at all times. # 5 Have realistic and worthy goals. Set challenging, but realistic goals that make you stretch out of your comfort zone. # 6 This is a team sport. No one succeeds in this business all by themselves. # 7 Learn how to uncover the need or desire that your prospect has. Show your prospect how to get what they want and they will move heaven and earth to get it. # 8 Show your determination to succeed. Let people know that you’re serious, that you’re committed, that you’re going to make this happen. The speed of the leader is the speed of the team. People want a leader that they can look up to. # 9 This is a business, not a rescue mission. It’s not your job to save people or make people successful. # 10 The key to keeping your own belief alive is to remember that your mission is to serve others. The more people you serve the more money you make. # 11 Build the people, and the people will build the business. This really is a people business, more than anything else. # 12 CEOs plan. Planning is a huge part of succeeding in their business. Spend some time each week to plan your business. Write down goals. Strategize whenever possible. Don’t let the minutia keep you from seeing the big picture. # 13 We committed to ongoing learning. Try to get a little bit better every single day. # 14 Even if you’re still the only member of your team, behave like a leader. Act like a leader at all times. # 15 It’s critical to find a few key players right out of the gate. Find 2-3 serious people as quickly as you can. # 16 Network marketing is the only profession I know of that levels the playing field for all people. You can come from Yale or you can come from jail. Although there is no guarantee of success in our industry, it is a level playing field. # 17 You want a sponsor who is going to tell you like it is. Look for someone who leads by example and tells you what you need to hear. # 18 You want a sponsor who will hold you accountable. You want someone who will keep it real with you and hold you accountable at all times. # 19 Sponsor with the end in mind, not just for instant gratification. Build relationships early and develop a successful business locally first. Build in your own backyard before you try to build out-of-state or out of country. # 20 It’s going to take three to five years to build a solid foundation that will allow for sustainable growth going forward. Don’t over-estimate what you can do in a year or underestimate what’s possible within five years. It takes time folks. Rome wasn’t built in a day. # 21 Comparing your progress with someone else’s story will rob you of the joy of your own journey. Never compare yourself with others. # 22 Go to as many events as you can – company events, generic events, conference calls. Attend all events and get your team members to events. # 23 Ultimately people don’t buy based on facts. They buy on emotion. We are all emotional creatures. Appeal to people’s emotions if you want to recruit more people. # 24 If you knew that you could set yourself up financially for life in the next 12 to 24, months, how hard would you go at it? Massive action is the key to being a success in network marketing. If you want it, go for it! 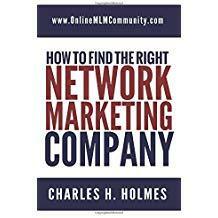 # 25 The biggest challenge that we have is that it’s too easy and too inexpensive to get started in network marketing. Most people won’t treat their business seriously because they don’t have much money invested in it. # 26 It’s much easier to go from $1,000 a month to $2,000 a month than it is to get from 0 to $1,000. Once you get a team going, it’s pretty easy to keep it going and growing. # 27 You never know when the timing is going to be right for someone. Stay in touch with everyone you talk to. # 28 Pick a company that will last. Partner up with an established company with a great reputation. # 29 Building a successful sales organization requires at least three to five years. Have some patience and be consistent. # 30 Is the product something you would use even if there was no business opportunity attached to it? The product must present a good value for the end-user, the retail customer. # 31 Most of the sales volume is made up of distributors who quit the business but they don’t quit the products. Most people who start with the business will stop and just revert to being a customer. # 32 Focus on building at home until you have a stable income. Build locally first. # 33 Be the person who attracts others. Become the leader so you can attract other leaders. # 34 The secret is in giving people time to warm up to you and the idea of network marketing. Most people you talk to will not join right away. # 35 Remove the option to quit. Get rid of your exit strategy and be all in. # 36 This is a business. You need to treat it like a business. It needs consistent effort. At the beginning you’re going to work really hard for very little so that later you can work very little for a lot. You get out what you put in. # 37 Find a “running partner.” Find one to three serious people as quickly as possible and run with them. # 38 Working directly with your sponsor is going to be a major key to your success. Work closely with your sponsor and stay in the trenches with them. # 39 The worst thing you can do is to let time go by without action and productivity in your first 30, 60, and 90 days. Get off to a good start in your business. # 40 All the people who were winning recruitment contests weren’t the big income earners. This is a leadership and team building business, not a recruiting business. # 41 They know how to create community and culture and team spirit. Good leaders create a strong team culture. # 42 The better person you become, the better the people you’re going to start attracting into your life. You attract more of what you already are. # 43 Worrying never improves anything. Focus on what you can control and don’t worry about things you can’t control. # 44 Target successful professionals. The ideal candidates are already in sales in some way. Your best prospects are people who are already successful in life. # 45 Make it your goal to hear as many no’s as you possibly can as fast as you can. Go for NO and you will get more YESs. # 46 The reason most people don’t succeed in this profession is because they’re not decision-driven. You have to follow through what you start if you want to succeed. # 47 80% of recruitment is non-verbal. People join people. Your prospect is watching you. # 48 I’ve routinely asked for two-year commitments. Get a commitment from your new person as quickly as possible. # 49 Go to your top three friends. Everyone can sponsor their top three friends. # 50 When you recruit new people, set initial goals that will require them to stretch a little bit, but not overwhelm them. Give your new people tasks and goals to aim for. # 51 Choose your sponsor carefully. The person you partner up with is just as important as the company you join. # 52 We’re driving a lot of amazing people out of the business by shoving leadership activity down their throats. Never pressure your people to do more than they are willing to do. # 53 Give them the time they need to grow at their own pace. Love on people and meet them where they are at. # 54 During your first year in network marketing you need to be recruiting like crazy. Bring in as many people as you can until you find your five serious people. # 55 Build your organization to the point where you have at least four well-developed lines in your downline chasing you. Build four good legs as quickly as possible. # 56 Recruiting is a process; it’s not an event. Recruiting takes time. You have to walk your prospect through a series of steps. # 57 Your upline wants to see by your actions that you’re serious about your business. Treat your business seriously and your upline will seek you out. # 58 Success comes when you focus on helping others get what they want. Show other people how to reach their goals and you will reach your goals. # 59 You’ve got to listen. Listen more than you talk. # 60 When we really know what other people’s pains and needs are, we will then know what specific solutions we have to offer them. Find out what other people want and show them how to get it. # 61 Don’t listen to people who don’t have what you want or who are not going where you’re going. Only take advice from people who are qualified to give it. # 62 You don’t try a marriage with the idea of trying it for 18 days and then quitting when it gets too hard. Take the long-term view and realize that it will not go exactly as planned. # 63 Connect deeply with others. Build friendships with everyone on your team. # 64 If you’re not sharing your opportunity with everyone you know, that’s an indication that you’re still split. Start out by contacting your warm market. # 65 You have to be all in. You can’t be wishy-washy and succeed. # 66 In network marketing, you succeed by helping others succeed. The only way to get what you want is to help others get what they want. # 67 You are the leader of your own tribe. You will build your own team and lead them, if you want to succeed. # 68 Dedicate 90% of your time to learning the business. Few people come into our industry with the right skills. You must commit to developing your skills before you can become successful. # 69 Your success is determined by your daily agenda. You are a creature of your habits. # 70 It’s like building a skyscraper. Things are going to be happening underground for a while before you see the building pop up. Typically, your first two to three years in this business are getting your foundation built. Once it’s built, the business can grow quite rapidly. # 71 I learned what truly grows and bonds a team was leading with compassion, leading with love. Build rock solid relationships with your team if you want long-term success. # 72 No compensation plan, product, or sponsor will get you there. Ultimately it’s going to be you who has to get you there. It’s not your sponsor’s job to make you successful. # 73 Stop trying to get out of the work. Do the work. When you look at who is successful, they’ve all put in the work. Roll up your sleeves, get to work, and never look back. # 74 The harder you fight for something, the more you’ll value it once you achieve it. Anything worth accomplishing requires a big sacrifice. # 75 The big stories are great. But the smaller stories will get you further. Most people would be very content with just an extra $200 to $500 per month. # 76 When you’re meeting with anyone, take the time to find out what it is that they want more of in life. Find out what other people want and then show them how the business or products will help them get what they want. # 77 People make money. But systems generate wealth. Make your business system dependent not people dependent. # 78 It’s going to take you at least the first full year just to figure out the business and learn your company’s products. It takes time to build up a successful business. The first year is a learning year. # 79 Get rid of excuses. Take responsibility. Your success is 100% up to you. # 80 If you are going to be successful, you have to take ownership of your commitment to succeed. I’ve never met a successful victim. # 81 All the money is in prospecting. Prospecting new people will solve all of your money problems. # 82 Unless you’re fully committed to network marketing and what it offers you in terms of future rewards, it’s just a wish. Not a dream. A mere wish. You have to be all in to make it to the top. # 83 Telling stories is a much more effective approach than merely sharing a typical business presentation of data and facts. Facts tell, but stories sell. # 84 If someone doesn’t want to be a customer or distributor, keep in touch with them anyway. People’s situation in life will change. Treat everyone well and stay in touch. # 85 Whoever recruits the most frontline people wins. Sponsor as many people as you can and let the cream rise to the top. # 86 If I have six to seven people on each team, my group will be a success. For every three people I talk to, one will want to see the business. For every three people who see the business, one will get in. For every three people who want to get in, one will do something with the business. This is simply a business of numbers. # 87 You have to stay emotionally detached from everyone until they start demonstrating that they will be with you. Don’t place your success in anyone else’ hands. Expect nothing from everyone you sponsor, but hope they will do something. # 88 Running a business in network marketing is a lot like flipping a well-shuffled deck (or multiple decks) of cards. Every time we introduce our opportunity to a new person, we’re flipping another card, looking for the aces. If we flip enough cards, we are going to find the aces. There are four aces in every deck. You never know when they will show up. # 89 A no today can be a yes at some point down the road. Everyone is a good prospect at some point in their life, even if they aren’t ready today. # 90 Our business is not for everyone in the corporate world. Not everyone is cut out to be an entrepreneur. # 91 I’m looking for people who are looking for something more. At the end of the day you are looking for people with a big, burning desire. # 92 Roadblocks will ultimately benefit you and improve your skills as a business leader. Every trial and tribulation you go through makes you stronger. # 93 This profession isn’t about pressure, it’s about service. Treat others well and focus on serving others. # 94 Love people where they are. Be patient with them and be a good example. Don’t pressure people to do more with the business than they are ready to. # 95 This is not a product business, it’s about helping people build their dreams. Build up the people and the product volume will take care of itself. # 96 People work harder for praises than they will for raises. People crave recognition and appreciation more than anything else. # 97 Build rapport with questions. Ask questions. Do more listening than you do talking. # 98 During the first month they’re in the business, I don’t want them talking to anyone about joining the organization. Get your people trained before you throw them to the wolves. # 99 The leaders who develop the fastest are the ones who delegate. Don’t try to do everything yourself. Empower others as much as possible. # 100 Influence is about being authentic and heart-centered. Lead with your heart. # 101 The way to go about creating authentic relationships online is to be who you would be offline. Be yourself, whether you are online or offline. # 102 Every single person who goes online looking for business also has a warm market. Always start out with your warm market. That is your best source of prospects. # 103 People who come to you through advertisements are still cold leads. Paying for advertising isn’t very duplicable either. Keep the business as simple as possible and don’t reinvent the wheel. # 104 Use social media to expand locally. If I were to move to a new town today, I’d start with Meetup, and then LinkedIn, and Facebook. These are great resources to meet new people in any location. # 105 Focus only on your successes. Everyone goes through temporary defeat. Focus on what is going right, not what is going wrong. # 106 Professionals get paid; amateurs don’t get paid. Enough said! # 107 Expose, present, validate, enroll, and support. Exposure is the money step. This is a numbers game. Work the numbers and then build relationships with the people you do bring into the business. # 108 Your warm market is any group of people who will warm up to you when they find out you have something in common. This is the best group of people to focus on in your business. # 109 The pace you set in your first 90 days foreshadows your long-term successes. How you start your business is a good indication of how it will end up. # 110 Present to partners together. If you are sharing the business with someone who is married or has a partner, make sure you share it with both of them at the same time. It’s the right thing to do. # 111 Think of your business in terms of 90-day micro-bursts. Do 90-day challenges whenever possible. This will but some momentum in your business. # 112 The very nature of starting any business is messy. The goal for the first year in any business is simply to survive. This book was first published in November 2013. It has 326 pages. The publisher is Martha Finney. The ISBN is 978-1939927675. It is available anywhere books are sold. 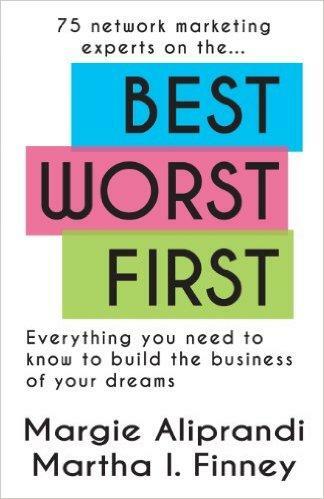 In conclusion, I give “Best Worst First” a 9 of 10 stars and consider it a must read. What do you think about all these great quotes? Which one is your favorite? Leave a comment below to let me know what you think. #9-Sometimes we get too caught up in trying to save others, we neglect ourselves and our business. #25-This is so true…if we had to invest more into starting the business, we wouldn’t be quick to quit or give up. #59-Listening is so important, because many people will give you the answer if you let them talk. All the other quotes are great too. This sounds like a great book. This is one of my favorite books about the industry.